Cylinders are shaped like a tube, with two circles at both ends that are identical and parallel. In geometry, you&apos;ll be required to use formulas in order to find the volume and surface area of this shape. 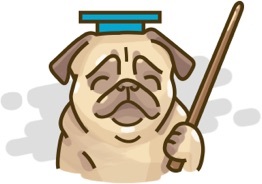 You will encounter problems that may not provide you with all the info you&apos;ll need to easily plug in numbers into the formulas, and that&apos;s where your previous knowledge of geometry will come into play. We&apos;ll teach you how to find the surface area and the volume of cylinders through an example question. This is not too difficult as we have a nice equation for finding both of these. So for the cylinder in the top left corner below, let&apos;s find the surface area first. To start off, we know that the diameter is equaled to 42 feet and the height is 110 feet. The units are consistent with one another, which is good. But we don&apos;t actually need the diameter all that much when it comes to the equation. Instead, we&apos;re going to find the radius using the diameter. If you recall, it&apos;s simple to convert between a radius and diameter. In this case, just take the 42 and divide it by 2 and you get the radius which is equaled to 21 feet. 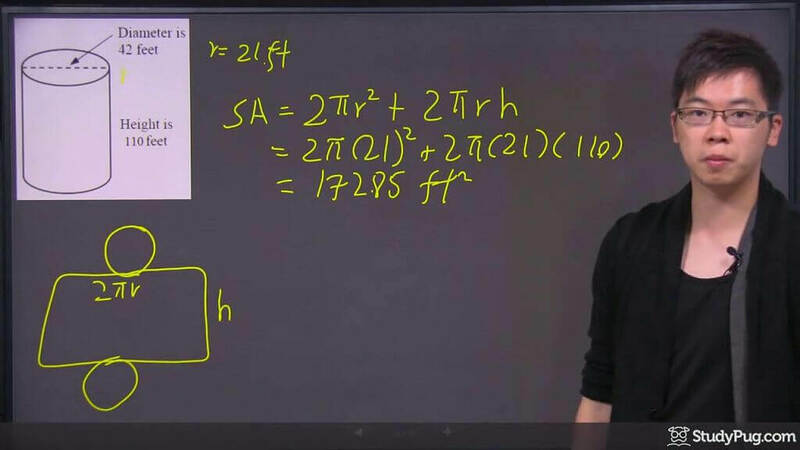 Now we can take this and use it in the surface area formula. 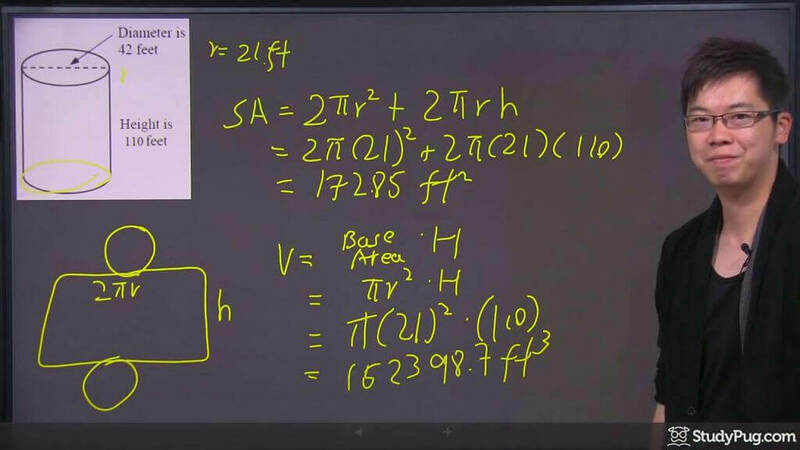 To begin calculating the surface area of a cylinder, we know that the equation says to take 2πr2 \pi r2πr-squared, then add 2πr2 \pi r2πr with the hhh, which is height. What is the idea behind this formula? It's actually pretty straightforward. If you were to unwrap a cylinder, you will see that it's a circle on the top with a rectangular shape in the middle and followed by another circle. We&apos;ve got a total of two circles and one rectangle. A circle&apos;s area is equal to πr\pi rπr squared, and thus, with two circles, it is 2πr2 \pi r2πr squared. The 2πr2 \pi r2πr from the second part of the surface area equation is to find the circumference of the circle, which also happens to be the length of the rectangle. It&apos;ll help us find the surface area of the rectangle, which is the height multiplied by length, and therefore equal to 2πrh2 \pi r h2πrh. Now that we understand where the equation comes from, let&apos;s just plug the numbers that we do know into the equation. 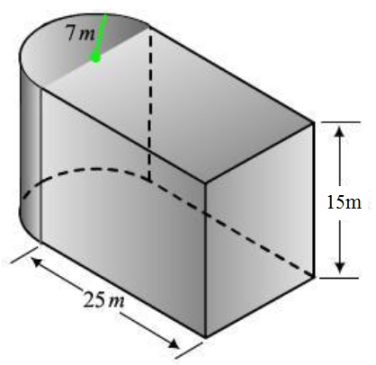 What is the cylinder surface area? We&apos;ve got the radius from the diameter previously (21 feet), and then we just use the height that was given to us, which was 110. Before we begin finding the volume, the below shows the volume equation that we&apos;ll be using. 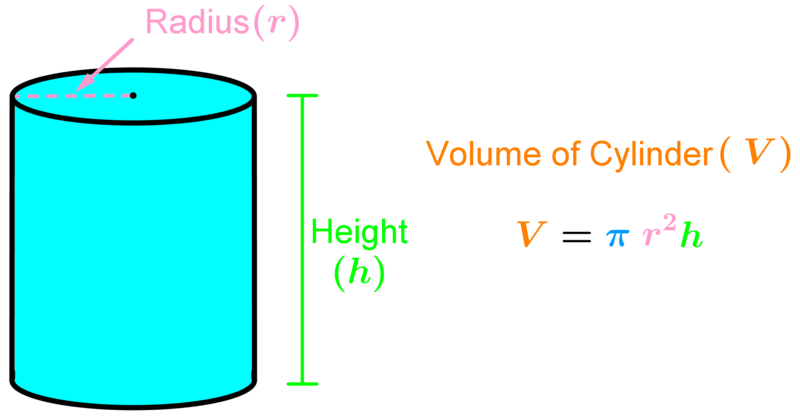 The volume of a cylinder is simply the area of the base multiplied with the height. Going back to the diagram of the cylinder, the base is circular. The top piece is also circular and identical to the base. We know that the area of a circle is going to be πr\pi rπr-squared. The height is given, and we know it&apos;s once again, 110 feet. What is the cylinder volume? Let&apos;s quickly fill in the information that we have and you should get 152398.7feet3152398.7 feet^3152398.7feet3. Remember that volume is in cubes, and that the surface area is in squares. Now you&apos;ve learned how to calculate the surface area and volume of a cylinder! 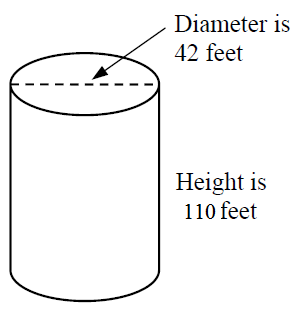 To see an interactive example of a cylinder&apos;s volume, try out this adjustable figure. A cylinder is like stacking up a pile of circle plates. With information such as, height, radius, and circumference, it is easy to calculate the surface area and volume of cylinders.Let's look at how to calculate the surface area and volume of composite solids too.